The upgraded one, please go after taking the backup by all means because past data may disappear. Let's do its best by the "Daimoku" first to get eternal happiness. 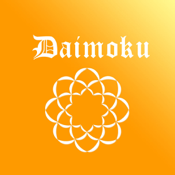 "Daimokuhyo4" is the Chanting application for a SGI member. This application will record the number of daily achievement using a timer tool and a calendar tool. 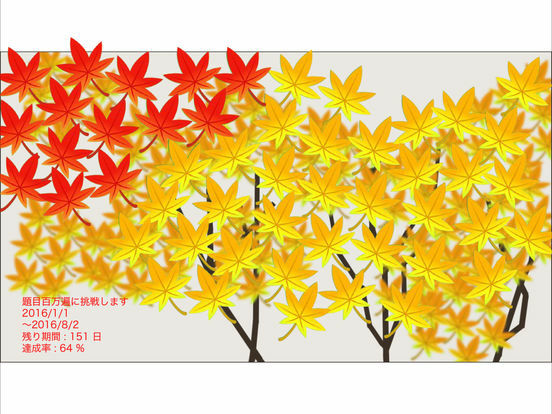 Your chant will be supported with filling of an image painting while enjoying oneself. As a feature, the painting-out movie and the percent complete are expressed as the beautiful full screen of force. 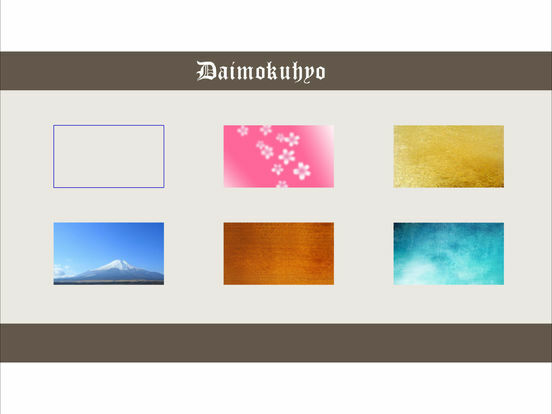 A background image can also be selected. I improved it to use this application promptly by adding a tutorial. 1. You input four items of the "Title", "Start date", "Goal date", "Target value". The challenge period is calculated automatically by the start date and the goal date. The accomplishment rate is an automatic ticketing from a target value and a present value. 2. When you input a daily chanting using a calendar tool, the "calendar" button taps it. 3. "Display" button when touching It becomes "Character selection" screen. I improved it to display the motto that you input. The movie of painting out starts when favorite "the painting-out movie" is selected. 4. When "P" button touches The display of present stage of completion stop is done by "the painting-out movie". 5. It will become a timer tool if a "Timer" button is touched. Since it is specializing in the "Chanting", it is the best for the count of the daily number of titles. 1. 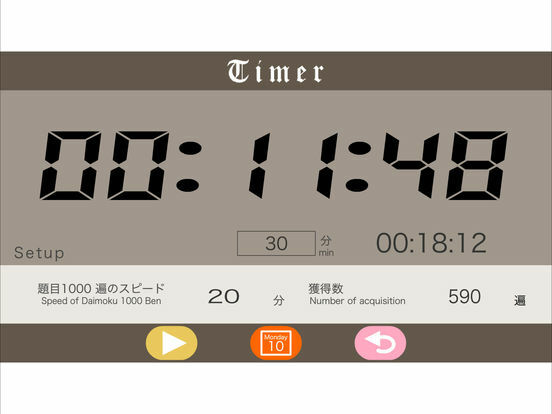 It becomes the double timer that a total timer and a countdown timer with the alarm linked. A timer tool is the setting a sleep doesn't do. It is a measurement start with the "Start button." 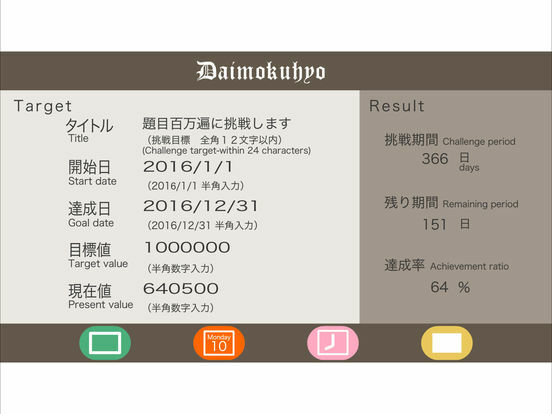 The "Stop button" stops and the number of Daimoku is calculated automatically and it saves. It is initialization of a timer with the "Reset button". 2. Although the speed 20 (minute) of 1000 Ben is set up by the default, it can change and can carry out a multi-stage setup. 1. A calendar of this month is automatically displayed and it is changeable with the triangular button in the right and left of a years display. 2. 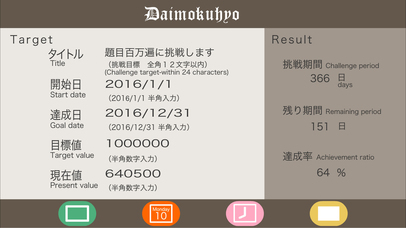 Since the Daimoku time (minute) counted with the timer tool is displayed, it will be displayed beside the date of a calendar. The total Chanting time and number of the total Chanting are calculated automatically. 3. The calendar tool cooperates with a timer tool. The Chanting time when you acquired it with a timer tool is displayed. 4. It becomes One-year count screen when you tap a "Count" button. 5. A "d" button of the right edge is delete button. When you want to remove all data which you input into a calendar, you tap it. Please reboot after finishing application once when you remove data. 6. The number of the Chanting is displayed every each month and, at the number of to date the total Chanting and mean Chanting time, the number of the remainder Chanting and average Chanting time to aim numerical value are calculated automatically and are displayed. 7. When you tap a "T" button, it returns to the first setting window.